The Chazen Companies is pleased to announce Elizabeth Bartosik and Johnathan A. Gell have received their Engineer in Training (EIT) designation. EIT is a professional designation from the National Council of Examiners for Engineering and Surveying (NCEES) to designate a person certified by the State as having completed a minimum of three years of post-secondary school with an accredited engineering program and has passed the NCEES six-hour Fundamentals of Engineering Examination. Receiving an EIT designation is one step toward Professional Engineer licensure. Bartosik works in Chazen’s Land Development group and has a broad background and experience, and supports a wide range of projects. Recently, she has been able to successfully complete applications for renewal of the Part 360 solid waste management facility permits for two transfer stations. Bartosik resides in Latham. Gell started with Chazen directly out of graduating from Clarkson University and works in Chazen’s Structural Engineering Group. He works on public and private sector projects and is helping develop Chazen’s 3D modeling standards in Revit. Gell resides in Troy. “We look forward to working with Liz and John as they advance themselves as the next generation of Professional Engineers” said Lanson A. Cosh, P.E., CCEO, Senior Structural Engineer, Project Manager, The Chazen Companies. 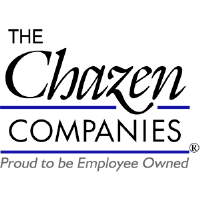 Founded over 70 years ago, The Chazen Companies is an employee-owned, multi-disciplinary firm providing civil engineering, land surveying, planning, environmental, building code and life safety services, landscape architecture, construction services, transportation planning and traffic engineering to clients in the private and public sectors. Chazen’s 140 employees proudly collaborate with municipalities, state agencies, developers, landowners, utility companies, and industrial, healthcare, education, and nonprofit clients from project concept to completion, taking a customized approach to every project. With offices in Glens Falls, Troy, Poughkeepsie and White Plains, NY; Nashville and Chattanooga, TN; and Portland, OR, Chazen delivers world class performance focused on creating effective, long-term partnerships with its clients. Learn more at www.chazencompanies.com.